I finally finished these postcards and have put them in my Etsy shop. Thank You Mimi for the great explanation of my invisible Jointing method. It is such a great method for jointing and safe for children. She said they were dangerousâ€¦sooooâ€¦.a bit of serious thinking transpired, inside they went, and WOW! What a better way to do it, unless the buttons are for decoration of course. Mimi, your Emma Rose bears no resemblance to the â€œrealâ€ Emma Roseâ€¦.WOW! what an adaptation! A combination of a Vintage style with contemporary. Love It! It is the Pressing down on the body that makes it a one person job. BUTâ€¦If you have a second person, they can press the joint area down after you pull, for the same result. 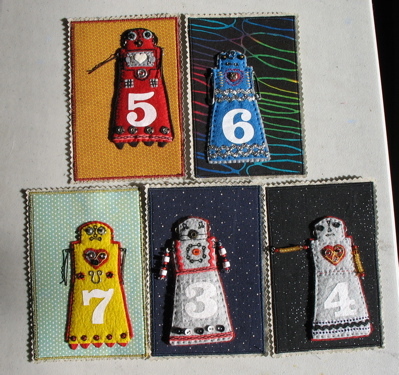 This entry was posted in applique, finished projects, General by mimik. Bookmark the permalink. I am so happy I caught this post early in the day! I ran over to your shop and bought #5 robot, and I am so excited! Also, thank you for posting Judi’s explanation, I really enjoy knowing the thought process behind the technique. How totally fun to get a comment from her! I’m writing an article about a doll maker who mentioned Judi Ward, so I looked her up on the net yesterday. The world is just so small nowadays! your cards are so wonderful! I just found your site today ! I love those robots. The numbers on them are a great addition. Talk about small world! I was just looking on the internet for how to create a doll joint, and the google search brought up your blog entry! I should have known that you would have shared this tip with the world. I’m thinking about exploring some interesting fox dolls during the holiday break and was getting prepared during my thinking phase.